The RMeter-MA10 is a UHF RFID battery-free resistance sensor tag. 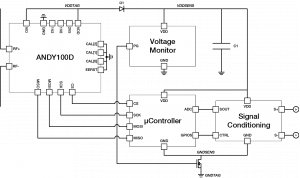 The device features a microcontroller with integrated ADC (10 bits) and signal conditioning circuitry for measuring resistive sensors. The RMeter-MA10 is ideal for monitoring magnitudes that change circuit resistances. The device provides a unique identification number plus the resistance value of the associated circuit. It works for applications using any kind of resistive sensor. This part is not recommended for new designs. Check EVAL01-RMeter-RM-DKWB.